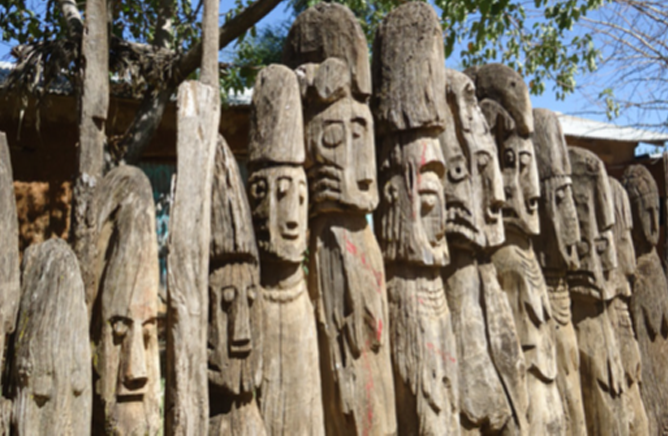 The term waka refers to wooden statues erected by Konso people for the memory of their heroes. By definition waka means a portrait of a hero. Hunting has been a highly prestigious occupation for Konso males, but only the lion and leopard confer honor on their killers. Hunting is significant to the Konso as the analogue of warfare, requiring bravery and skill...” (Hallpike, 1970:40). Although Hallpike’s statement is limited to the killing of lions and leopards, we have learnt that men who killed buffalos enjoy the same honour as heroes. The Konso perception of heroism has brought the erection of monuments on the graves of hedalitas (heroes) an important part of their culture since a long time ago. Although a waka is (by terminology) a wood-made portrait and it refers to a wooden statue erected in memory of a hedalita .It does not mean that they erect a single waqa to represent only the person himself. Rather, they erect a number of statues upon the same grave at the same time. For example they erect statues representing enemies those killed by him. In addition, if he used to kill one of the big wilds, the figure of the wild would be curved out of wood and be placed on the same grave in front of the statues. The practice of curving figures to represent his weapons (spears & shields) and erecting along with the waka is also a traditional experience. In general, Konso waka could be understood as existing evidences about the story of the lives and heroic deeds of the hedalitas they represent.